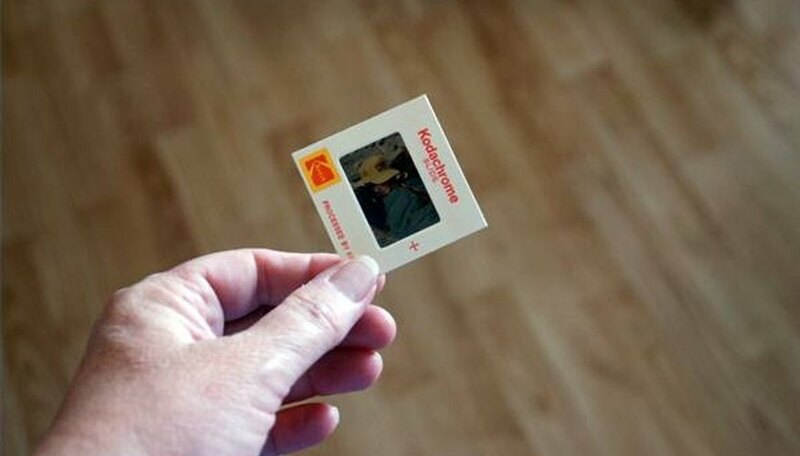 At one time if you wanted to convert a slide to a picture or photograph, you would take the slide to the photo developer and have them make a print. Today you can convert your own slides to a picture, provided you have a scanner designed to scan slides. Many affordable desktop scanners have slide and negative attachments. 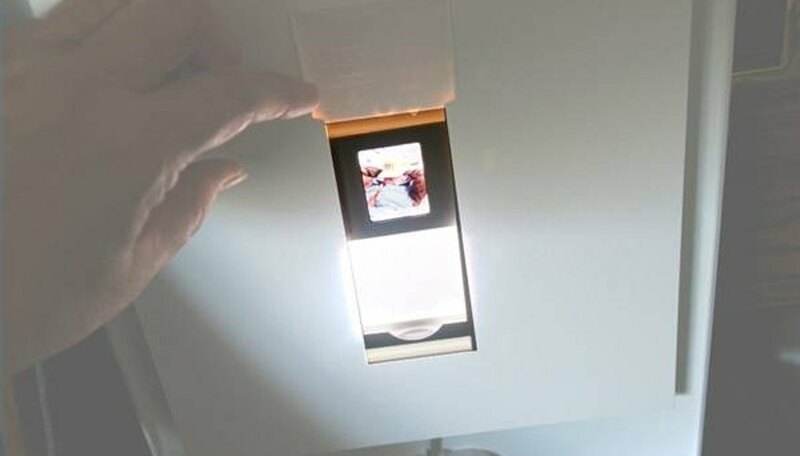 If yours is one, then you can convert your slides to a digital image which can be printed out on photo-quality paper. Open the lid of the scanner and insert the slide in the slide and negative slot. The scanner in the photograph is designed in this manner, although some scanners have a separate slide scanning attachment. When inserting the slide, the side laying on the glass will be the back of the slide, or the side that typically has no writing on its cardboard frame. If you insert the image the wrong way, you will create a mirror image. 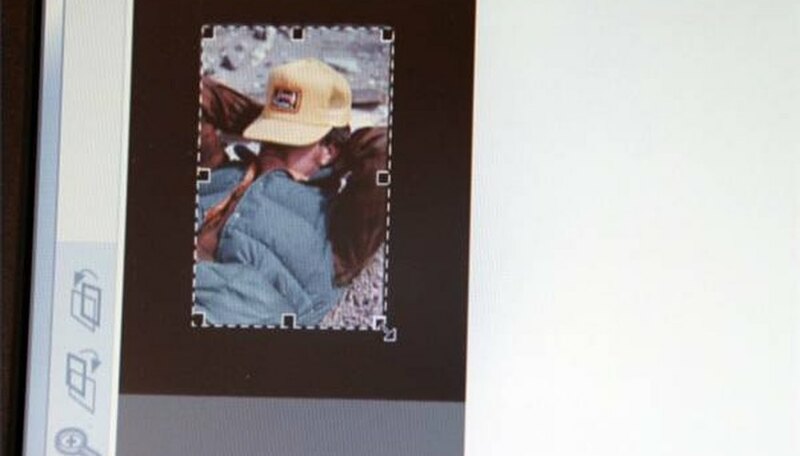 For example, on the slide being scanned in our picture, there is writing on the baseball cap. If we turn the slide in the other direction, the finished picture will have a baseball cap with reversed writing. 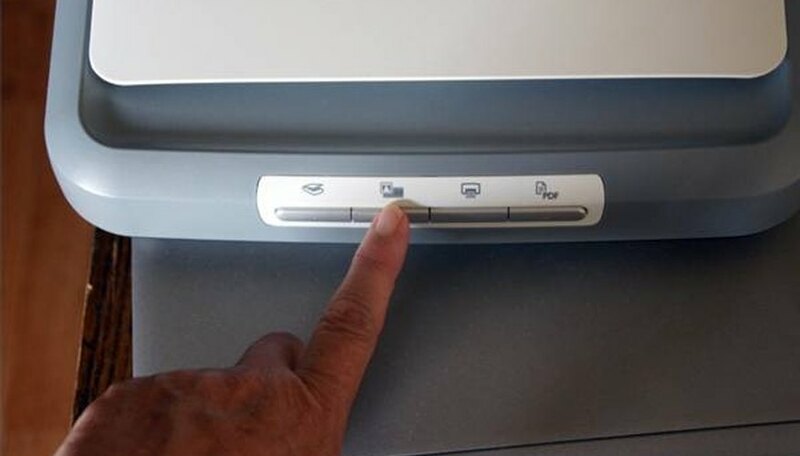 Close the lid to the scanner and push the button that tells the machine you are scanning a negative or slide. On the scanner in the picture, this button has an icon that looks like a slide and film. Choose to scan a slide in the menu that pops up. 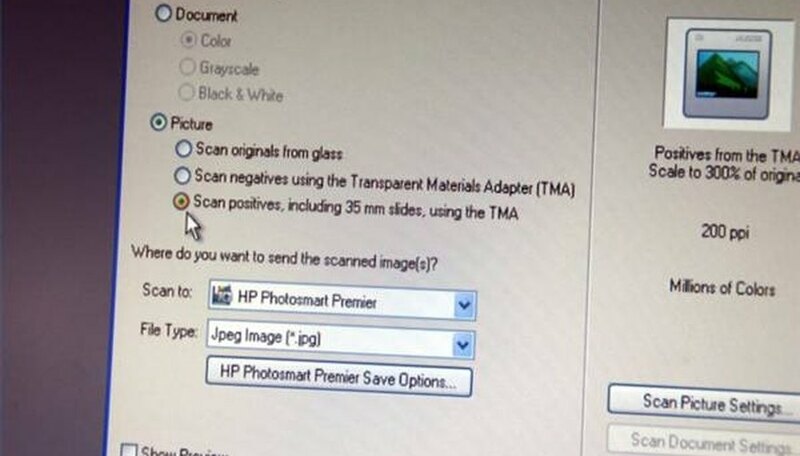 If you were scanning a picture or negative, you would make a different choice. 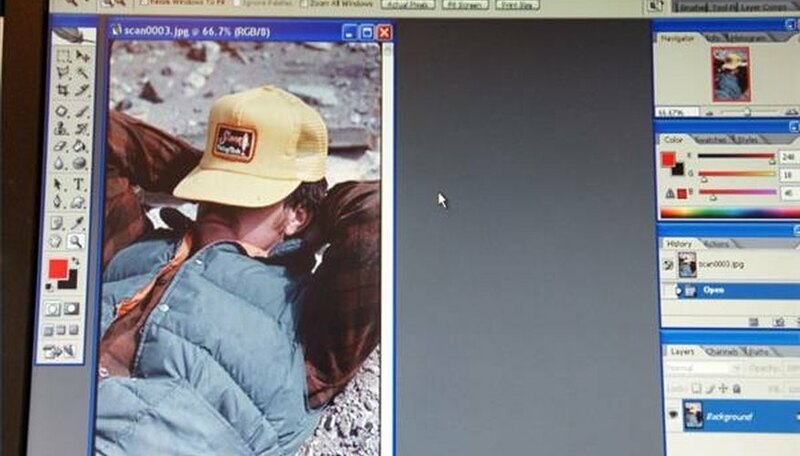 Click the option to preview your image before scanning. If your scanner has this option, check this so you can position your scanning border if necessary. Reposition your scanning border if necessary. There should be dotted lines around the area to be scanned. If you want to enlarge or reduce that area, pull the corners in or out using your cursor. 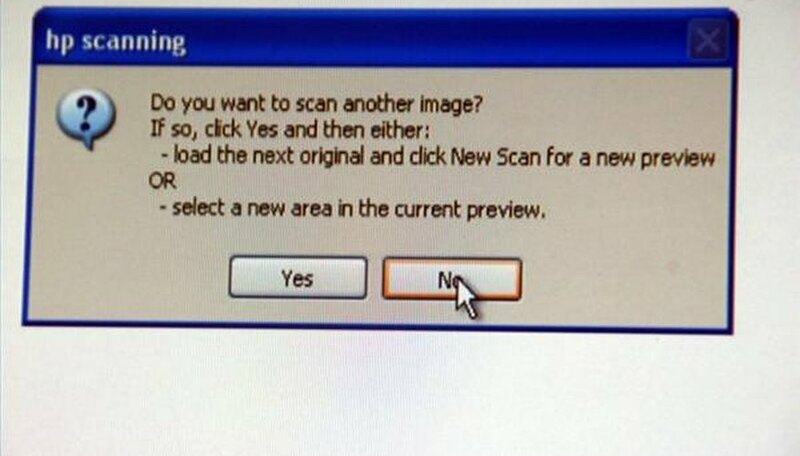 Click the Accept or scanning command to continue with the scan. Choose to scan additional negatives, or stop scanning. Your new digital image will be saved to a file on your computer. Open the digital image in a graphics editing program to print a picture. 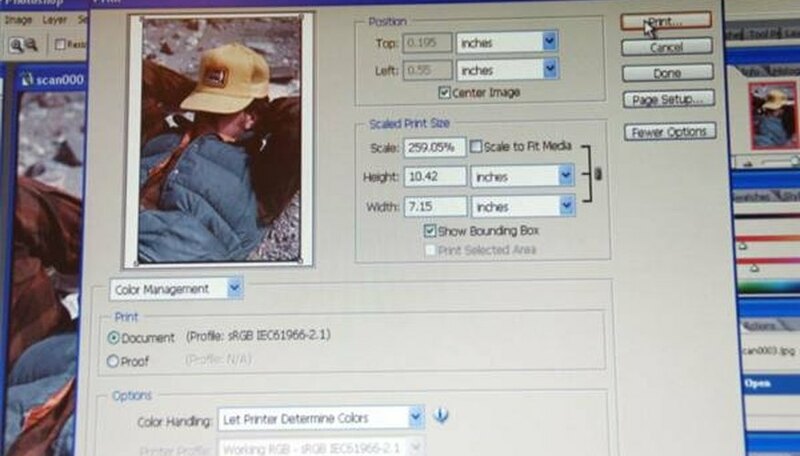 Choose a Print Preview option, if it is available on your graphics program. In the photograph we are using Photoshop, which allows us to choose the size of the picture. When printing, use photo-quality paper for best results. Keep the slide and scanner dust-free for best results. Professional slide scanners are available for better quality results. The operating instructions may be different for you scanner. How Can I Convert Kodachrome Slides to Digital?